"showcases the dancing at its finest"
Baz Luhrmann’s Strictly Ballroom the Musical plays at London’s Piccadilly Theatre, following a hugely successful 2016 revival at the West Yorkshire Playhouse, starring Gemma Sutton and Sam Lips. Based on Luhrmann’s popular 1992 film of the same name, Strictly Ballroom tells the story of Scott, a competitive ballroom dancer who is used to breaking the rules. When he teams up with left-footed partner Fran, Scott goes against the odds in order to follow his heart. With a score by Luhrmann and Catherine Martin, and a book by Luhrmann and Craig Pierce, the sensational musical features hits from stars across the world, including Cyndi Lauper’s “Time After Time” and Doris Day’s version of “Perhaps Perhaps Perhaps”. 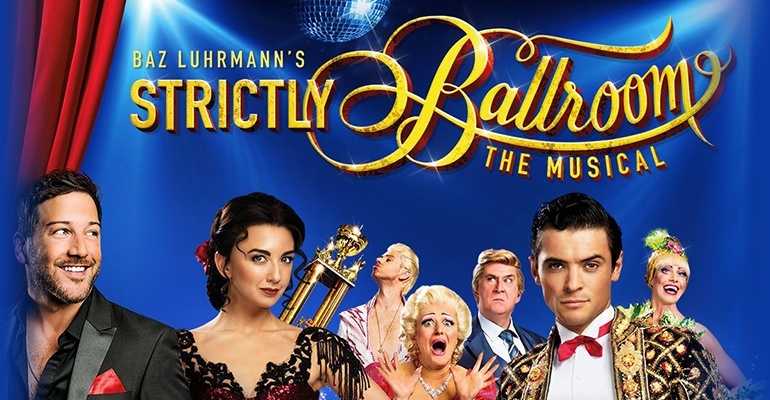 A kaleidoscopic musical that invited the whole world to start dancing, Strictly Ballroom the Musical is the dazzling production that plays a strictly limited season at the West End’s Piccadilly Theatre. Strictly Ballroom the Musical is recommended 12+. No under 5's. Show is great, staff are brilliant but the seating in the Royal Circle is awful. Was treated to a ticket to see Strictly Ballroom the musical for my birthday. Being tall and overweight I am often apprehensive about going to the theatre due to the discomfort. Upon finding out that the show was at the Piccadilly I was relieved having been to see Jersey Boys there and it being no problem. However this time we were in the Royal Circle row F - great view but the leg room was awful, the onset of cramp was almost immediate. I moved to a nearby empty aisle seat that had been vacated by a chap who found more leg room on another row, this was even worse as the binoculars digs into your leg. I couldn’t take it and spoke to a member of staff and all of whom couldn’t not have been sweeter. For the first half of the show they allowed me to sit on one of their special seats and for the second half a lady called Faran offered for my friends and I to go down to the Stalls and there the leg room was completely fine and the seat pretty comfortable and we were able to appreciate the rest of a the great show. I therefore want to forewarn people about the leg room in some of the Royal Circle (others were also complaining) and suggest if you are tall that the stalls are a much better option. Thanks to all the staff my night was not ruined. Amazing show, fantastic dancing but the sound quality was very poor - really difficult to hear the lines unfortunately. Strictly Ballroom is first class. My favourite all time show,will be seeing it again and highly recommend. What a lovely theatre. The staff are exceptional. Very friendly, efficient and professional . Thank you for keeping my bag safe when I left it behind after the show. Also for your prompt attention when the lady next to me became unwell towards the end of the performance. We had tickets for this on Saturday 2nd June. Good show but lighting and sound failed just before finale. I’m trying to claim compensation through ticket insurance. Can you confirm this happened. An absolutely fabulous show. Superb dancing and great fun. Even better than the film it is based on. Got a standing ovation on the night I attended. The best thing I've seen in the West End since Jersey Boys. I smiled from start to finish. The best kind of feel good show and all the cast were absolutely fantastic. Go see it!